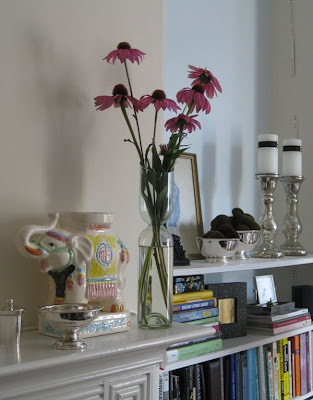 Here it is with some pretty pink coneflowers from my Mom's garden. Thanks again Marni- I love it! Really love this! So unique! Oh love this! Congrats on winning it! Now on to more important things. You've been holding out on me. Where is that elephant from! I must have it. I think it would enjoy a nice vacation in NY. didn't you include that elephant in an earlier post? Love it. and very cool and different vase! This is so pretty. Congrats on winning!